where can i find a nismo v3 spoiler? You didn't say replica in your post. No one makes a replica yet. Google pulls up Z1 on the first link selling the OEM part. The OEM part is expensive and the only one available. I see now you put STYLE in your original post, but this doesn't necessarily constitute replica. Last edited by Al Kapwned; 02-09-2010 at 08:30 PM. im sorry for the confussion, i make sure to search, which is why i posted so bluntly asking. thanks. Good luck.. I got mine here and there currently isn't any knock offs. Got to pay to play. You aren't modding a Civic. And I hope you have a lot more body pieces to go along with the spoiler. It is way too aggressive to be on the car alone. FYI you really disappoint a lot of people on here when you come back at a member who basically draws you a road map of where to get one. Not to mention knock off?! This is the kinda crap that ruins the forums for me. Don't be one of those guys. Leave the eBay Sh*t to the Honda crowd. Do your car right and the industry right, by buying AUTHENTIC PARTS!! this spoiler would not be as cool if every person that thought it was neat bought a "replica" (which is just another way of saying, I'm a dirt bag company that can't think of my own ideas and I'll just steal others). OEM V3 bumpers pop up for sale! Follow the classifieds or put up a WTB thread!. 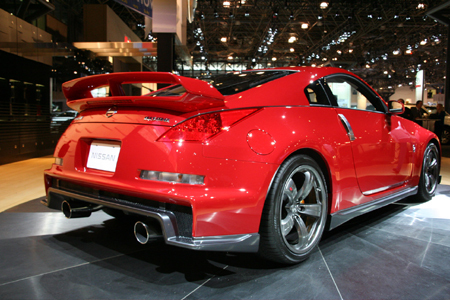 Quick Reply: where can i find a nismo v3 spoiler?